Olympic hurdler Andy Turner has accused the independent panel that confirmed his funding cut of having a "ridiculous lack of knowledge" about the sport. UK Athletics (UKA), the governing body, removed the 28-year-old from its list of lottery-funded athletes in November. Turner, convinced he had been harshly treated, challenged the decision but his third and final appeal failed. "They are writing me off now but I'm only getting started - I think they have made a mistake," said Turner. "I think they've made an example of me, and others have said the same, but I don't know what goes through their minds." Turner, who won Commonwealth and European bronze medals in the 110m hurdles in 2006, was perhaps the highest-profile athlete to miss out when UKA announced the list of 33 names who would receive financial support in the build-up to August's 2009 World Championships in Berlin. That list, the "world class performance programme", represented a 20% cut in the number of funded athletes and was widely perceived as a declaration of a new, tougher, more performance-related approach. On Friday, though, Turner's fellow 110m hurdler Allan Scott and 800m disability runner Danny Crates had their appeals against funding cuts upheld and have been added to the list of supported athletes. A statement said Scott, 26, was able to present statistical evidence to the panel that he is improving sufficiently to being capable of a top-eight finish in Olympics or World Championships within the next two years. Turner, who ran a personal best of 13.27 seconds in the semi-finals of the 2007 World Championships but has struggled since then, was left stunned by the decision and immediately started appeal proceedings. The first and second stages of the process were written requests sent to UKA chief executive Niels de Vos, both of which failed, prompting Turner to pay £250 for a final hearing from a three-man panel in London on 15 December. The panel comprised barrister Hugo Keith, Conor O'Shea - the national director of the English Institute of Sport - and Derek Mapp - a former chairman of Sport England and current chairman of the British Amateur Boxing Association. "(The UKA) said I was too old to run a personal best and too old to make a major final, but that is completely ridiculous," said Turner. "I'll be 31 in London (for the Olympics), (American star) Allen Johnson won a World Indoors medal at 38. I'm a late developer, some people are, but (UKA) don't care. "I look at the list of people they're funding and half of them have got no better chance of making a final than me. So I don't really know what they're on about. "I ran 13.2 in 2007 and that's going to make most finals. That kind of time is probably going to put you fourth or fifth in an Olympic final but anything can happen in hurdling, people fall over, a medal is possible. Colin Jackson won a silver (at the 1988 Olympics) with the same time as my personal best." But while Turner remains Britain's number one in the event - and his personal best is the third quickest by a Briton - his form since 2007 has been disappointing. 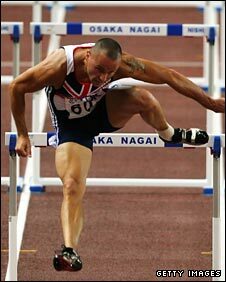 A succession of injuries have not helped but Turner's best time in 2008 was a 13.41 (with the maximum legal wind behind him) in May, and he went out of the Olympic competition in Beijing after a 13.53 in the second round. And with UKA under pressure to deliver more bang for our bucks, under-performing athletes like Turner were always going to be vulnerable, particularly after the sport failed to reach its Beijing medal target. That result led to the exit of performance director Dave Collins, the arrival of Dutch taskmaster Charles van Commenee and UKA being given 5% less for London 2012 than they had for the 2008 Games. A spokesperson for UKA explained that funding is for athletes who have provided evidence they have the ability to finish in the top eight at a world championship or Olympics, or have already done so in the last two years. "The criteria against which athletes are measured is transparent and is applied in exactly the same fashion to every athlete who is considered," they said. The spokesperson added the "robust process" of selecting funded athletes is backed by UK Sport, the agency that distributes public money to elite sport, and conducted by performance experts. "The process does not take into account an individual's personal circumstances, but considers only their ability to succeed on the highest stage. This is how UK Athletics is measured, what lottery money is invested in and what the performances of athletes must reflect," they said. Turner is determined to prove UKA wrong but he admits it will be a huge task now his £18,000 annual grant (plus medical support) has been taken from him. Are UKA right to take funding away from Andy Turner? Is he a late bloomer or a diminishing talent? The former schoolboy football star continues to train full-time with Christine Ohuruogu's coach Lloyd Cowan in east London, but with a mortgage to pay, and a young family to provide for, the future looks bleak. Even part-time work, fitted around his training, might not be enough to meet his outgoings. "It's difficult, it's been my whole life for 10 years and my dream since I was a kid," he said. "All I can do now is run a personal best. My plan is to prove them wrong. "I'm so frustrated by the whole thing I'm just going to get on the line and show them that they have made a mistake."